Melt chocolate, spread it out, and add your favorite toppings–that’s almost all there is to making bark. We added one important step, though: tempering the chocolate (carefully melting and cooling it to specific temperatures while adding large chunks of unmelted chocolate) so the bark stays shiny and snappy. For other flavor options, try White Chocolate, Pistachio, and Apricot Bark or Nutella Bark. Put chopped chocolate in a shallow, medium heatproof bowl. In a medium saucepan, bring 1/2 in. water to a bare simmer. Set bowl over pan and heat chocolate, stirring often, until melted and registers about 115° on a digital or instant-read thermometer, 3 to 7 minutes. Remove bowl from water and dry underside. Let chocolate cool (at first, it will rise about 5°), stirring constantly, to 95°, 5 to 12 minutes. Add large chocolate pieces and stir constantly until chocolate cools to 88° to 90°, 2 to 3 minutes. Spoon out unmelted chocolate and save for other uses. Pour melted chocolate onto center of parchment and spread with an offset spatula or flexible scraper to about 1 in. from pan edges. 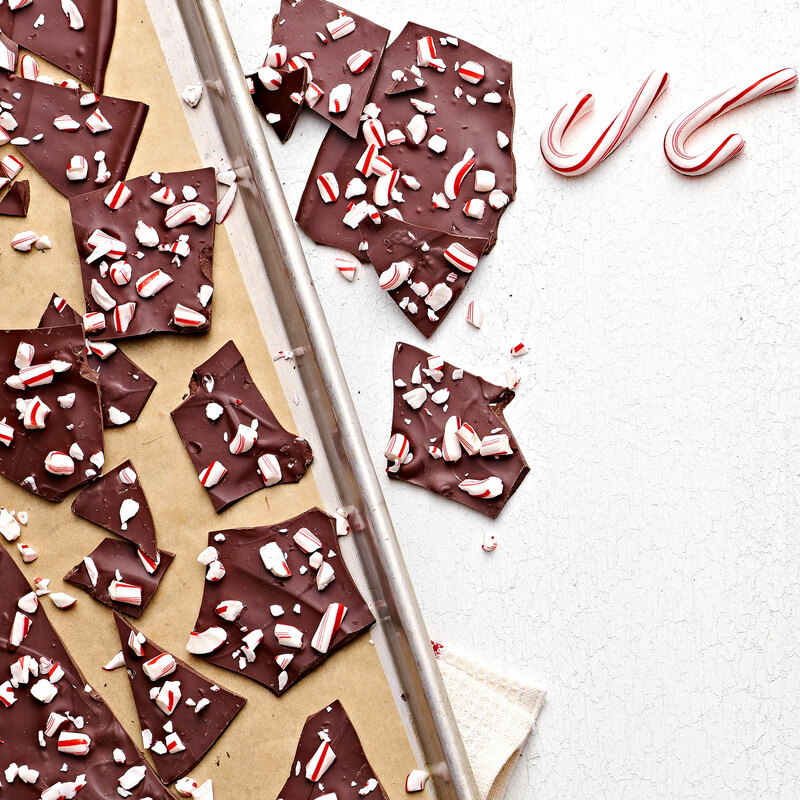 Sprinkle with peppermint candies and gently pat them into chocolate. Set pan on a cooling rack and let stand at room temperature until chocolate is firm, about 1 1/2 hours. Break bark into pieces. Make ahead: Up to 1 month, airtight at room temperature.